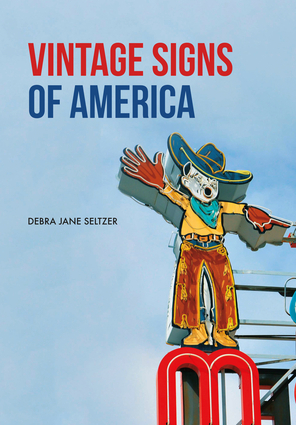 Debra Jane Seltzer’s beautiful collection of images features some of the most stunning signs that remain on public display in the United States. The focus is on neon signs from the 1940s and 1950s. There are also examples of increasingly rare opal glass letter and bulb signs from the 1920s and 1930s. In addition, you will find stylish and underappreciated plastic signs from the 1960s and 1970s. Represented within are Sputnik-shaped signs, mechanical signs, as well as signs with representations of pizza chefs, diving women, animals, doughnuts and more.There is also a discussion of the vulnerability of these signs due to their deterioration, changes in sign laws, and the popular transition from neon to LED lighting and electronic displays. Maintaining these signs has become too expensive for most business owners. In recent years, countless wonderful signs have been hauled to the scrapyard. A much smaller percentage have been saved, restored, and/or relocated through community action and online fundraising efforts. Other signs have found new life at museums or have safely vanished into private collections. This book offers suggestions as to what you can do to save these signs.Vintage signs are unique works of art and craftsmanship. They are personal connections to the past and community landmarks. They have also become tourist attractions. However, the signs which appear in this book could disappear at any time. So, see them and shoot them while you can. Debra Jane Seltzer has been documenting signs, buildings, and statues for more than 15 years. She has logged more than 400,000 miles maniacally gathering photos from 48 states. Her comprehensive website, RoadsideArchitecture.com, features more than 2,500 pages and over 60,000 photos. Since 2007, Debra Jane has been writing about vintage signs for the Society for Commercial Archeology Journal.